Water was entering this doorway, a drain was added and eliminated the problem allowing the customer to have a dry entrance to their church. This sea wall was aging and could not support a full horizontal load of fill dirt. The access limitations also played a key role in determining the best way to handle the situation. The project was properly permitted and completed with a lightweight mulch and filtering fabric. This allowed the ground water to flow into the river and have less of an impact on the environment around the area. 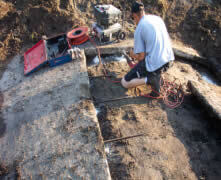 Florida Topsoil specializes in drainage projects that require skill, expertise and experience. The structure seen in this picture weighed 44,000 lbs. and was custom built and installed within 1/1000th of an inch of accuracy. Improper drainage connection by other contractors who were not properly trained, caused this pipe to fail. Florida Topsoil was called in to correctly repair the problem before any further damage could be done. This was also improperly installed by another contractor. Immediate repair was dispatched to prevent severe flooding downstream to homes. 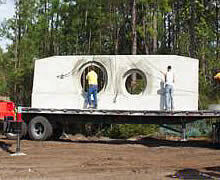 Site preparation, construction and problem resolution are our trademarks. As a state licensed contractor, Florida Topsoil has been a leader in meeting the needs of industry for more than twenty years. The Site seen in this picture was managed by Florida Topsoil for production for quality products provided to Homeowners, Developers and Factories.